Some Chelsea fans took to Twitter to vent their frustrations after a lacklustre first half showing from Maurizio Sarri’s side. City starlet Phil Foden turned provider for Sergio Aguero in the 13th minute of the game, as the Argentine struck home his 200th goal for the club as the Chelsea defence watched on in despair. Creative stars Foden and Bernardo Silva ran riot during the first half creating several chances for the reigning Premier League champions, and that led to the reaction below from some Chelsea fans at the break. Fabregas, Pedro, Luiz & Alonso all getting exposed against Manchester City. I hope Chelsea board is watching this game. We badly need signings!! We always have a manager who has won NOTHING…..expecting to lead us to trophies ? Dreadful performance. Willian needs to come in for CHO. We more energy in midfield,probably Bakayoko because Fab is getting overrun. The general consensus is that Chelsea are in dire need of more signings if they wish to pose a threat this season, as their lack of energy in midfield proved to be a significant factor during the game. 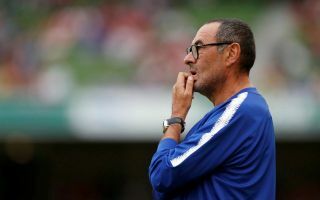 The Chelsea board now have the challenging task of making key additions to the squad before Thursday night’s deadline, to give Sarri the tools necessary to ensure that they improve on last year. Antonio Conte lifted the FA Cup last season, but he failed to secure Champions League qualification and that ultimately was the overriding aspect in a disappointing campaign for the Blues.